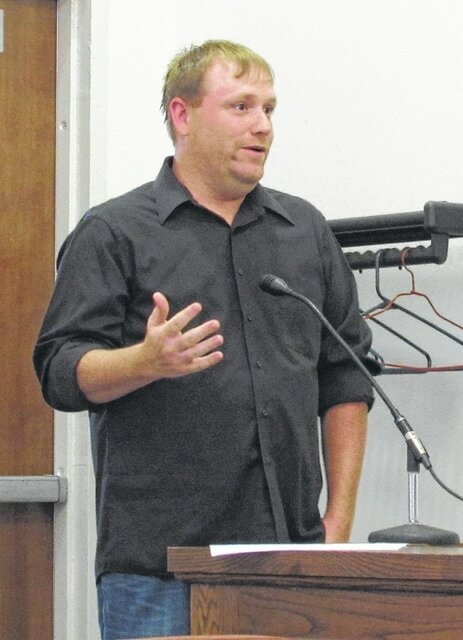 Catch 22 owner Mark Clyburn spoke to the Greenfield Village Council on Wednesday about holding a music festival at Mitchell Park. A local business owner who’s hoping to put on a music festival as his business approaches an anniversary asked permission from Greenfield Village Council members at its Wednesday meeting for the use of Mitchell Park for the anticipated event. Mark Clyburn owns Catch 22 Sports Bar, which opened its doors about a year ago. To celebrate, Clyburn said he’d like to have a music festival at Mitchell Park in August. Also, he said he’d like to see the event become an annual occurrence. Clyburn said he has already talked to the state liquor board about obtaining a one-day license, and was told that was possible when the village was on board since Mitchell Park is the property of Greenfield. Concerns raised by members included being able to cordon off the whole of the event area to keep it limited to those 21 years old and over. But Clyburn said he would do whatever the village wanted him to do in that regard. He said the event was geared toward an adult crowd and he planned to have patrons purchase wristbands. He also said he would provide security for the event. Greenfield City Manager Ron Coffey said he already spoken to law director Brian Zets who “had some misgivings” insofar as liability to the village. But, Coffey said Zets continues to look into the matter. Council chair Betty Jackman said they would also have to look into what else might be going on around the hoped-for Aug. 22 date for the event. Coffey added that there had been talk about a fundraiser baseball tournament on that date. Jackman advised Clyburn to come to the next village council meeting on July 15 and the council would likely have an answer for him. In other business, Coffey talked about Corvac Composites, which recently announced its intention to purchase the RR Donnelly building and bring about 200 jobs to Greenfield. “This announcement is pursuant to a due diligence process and completion of the purchase is anticipated in the third quarter of 2015,” Coffey reported. He said the company has inquired about Greenfield’s rail spur and possibly using it to receive its raw materials. Also reported by the city manager is that there is a new agreement in the works for the bike path that begins at Felson Park. Apparently, the previous 15-year agreement between Greenfield and the Ohio Department of Natural Resources expired last year without either entity being aware of it. Finance Director Carolyn Snodgrass reported June’s preliminary numbers as follows: month-to-date expenses, $397,728; month-to-date revenue, $314,149; year-to-date expenses, $2.45 million; and year-to-date revenue, $2.27. The general fund balance as of June 30 was $413,491. One of the reasons the month-to-date expenses appear to outweigh the revenue was because $29,000 was paid toward railroad expenses and $146,000 was aid on loans, Snodgrass said. Another reason is that the village purchased an SUV as a new police cruiser with money donated by Greenfield Community Television (GCTV). As previously reported, GCTV donated $37,000 in early June specifically for the purchase. Snodgrass said Wednesday that a 2015 Ford Interceptor was purchased for $27,038, and that the rest of the donated funds will cover outfitting the vehicle for use by the Greenfield Police Department. Greenfield Police Chief Tim Hester said Friday that the department wanted to get an SUV in part to be able to navigate more safely and certainly in winter weather. He said the department previously had an SUV and that when it was done, the department didn’t replace it. Decals have already been applied to the new cruiser and now the SUV is in Cincinnati being outfitted. He said the new cruiser is anticipated to be ready in about a week. Council member Bill Redenbaugh, who also serves on the Paint Creek Joint EMS/Fire District Board, reported that the district is seeing the benefits of having gone to a new billing company. He said it didn’t mean more money for the district, but meant that money was received by the district much faster than with the previous company. Redenbaugh said that the 2016 budget for the district was approved by the board at its previous meeting, and the final budget is expected to be approved at the next board meeting, set for July 14 at 7 p.m. at station one on North Washington Street in Greenfield. The meeting is open to the public.